Strategically located between Bangkok and Saigon, Phnom Penh is at the centre of the East-West corridor between two of the regions major regional trading hubs. With an open door policy on foreign domestic investment (FDI) and a stable political environment, Cambodia has witnessed an influx of foreign developers seeking to take advantage of the relatively low land prices and an increasing demand for international standard real estate products. Compared with other Asean markets Cambodia is particularly investor friendly, enabling companies to be 100 per cent foreign-owned. This, coupled with the low cost of labour and comparatively low rental rates, makes it an attractive destination for companies to set up operation. We are already seeing significant FDI in infrastructure in the industrial sector with the majority of FDI coming from China and Japan, a trend we expect to continue. 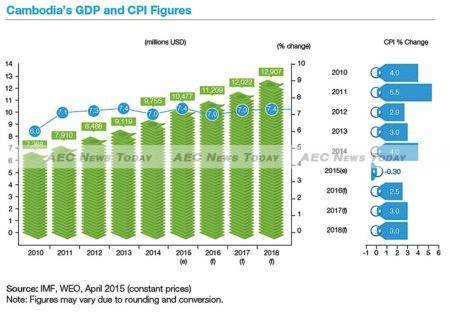 This is reflected in 2015 Cambodia GDP forecast to grow at 7 per cent, with growth forecast to grow at in excess of this through to 2018. Cambodia’s four main engines of growth – manufacturing, agriculture, tourism, and construction – continue to drive the Cambodian economy, with the construction industry’s contribution growing alongside the rapidly developing real estate industry. To facilitate increasing FDI into Cambodia the Government recently approached the Royal Institution of Chartered Surveyors (RICS) to assist with the creation of a Construction Code to improve building standards, and to advise on the implementation of fire and health & safety standards. This not only benefits the people of Cambodia, but also provides additional investor confidence. Cambodia is entering a new era of economic development. With an abundant supply of natural resources and fertile land, we anticipate that the Cambodia agricultural sector will be the next key growth area. Currently, it is underutilised due to a lack of local expertise. Asean Economic Community (AEC) integration is expected to increase employment and the volume of skilled workers, which will positively impact the commercial sector as more companies seek to take advantage of investment opportunities. Cambodia was severely impacted by the global financial crisis due to its economy relying heavily on exported goods. Land prices in prime locations declined by as much as a half between 2008 and 2010, with numerous large-scale development projects being placed on hold. With the implementation of government policies enabling strata titling and foreign ownership the decline in land prices reversed towards the second half of 2010, supported by increasing demand from foreign purchasers of condominiums and rising rents for both office and retail space due to a limited supply. Land prices in Phnom Penh have increased by as much as 80 per cent since 2010, with a forecast of a further 25 per cent increase for 2015. Leading the charge in the construction sector are investors from China, Korea and Japan. Approximately half of the occupiers of purpose built offices are international banks, insurance and investment firms, as well as logistics, construction and engineering companies, which usually take up larger spaces. 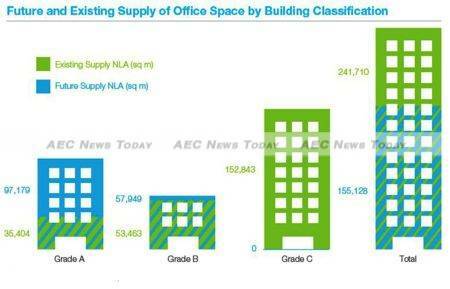 Cambodia office stock will see an increase of 64 per cent by 2018, with 60 per cent of the incoming supply classified as Grade A and 40 per cent classified as Grade B.
Hongkong Land, ACLEDA and the Overseas Cambodia Investment Corporation (OCIC) will add a combined total net lettable area (NLA) of 112,180 sq m (1.207 million sqft), or approximately 72 per cent of the total incoming supply. Prime rental prices remained stable during 1H15 showing only a slight increase of 2 per cent from 2H14, with the city-wide average rental recorded at US$14 per sq m per month ($1.30 per sq ft per month) across all office grades. Occupancy of prime office space remained subdued at 44 per cent, showing a 3 per cent decrease in vacancy between 2H14 and 1H15. Current Cambodia per capita retail space of 0.0087 sq m (0.0936 sq ft) points to an undersupply, especially when compared to regional neighbours, Thailand and the Philippines. Average vacancy across all retail grades is 14 per cent with a 122 per cent increase in current NLA expected by 2019. Future supply will consist of 88 per cent prime space and 12 per cent secondary space, with 60 per cent located in central areas. 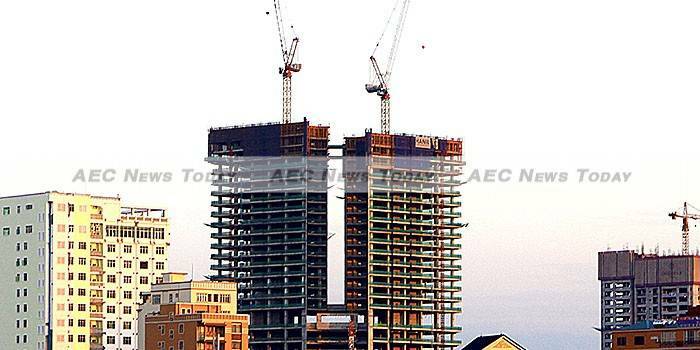 With the impending future supply, the current undersupply will be catered for, with concerns of a possible oversupply in the Cambodia property market by 2018. Exchange Square by Hongkong Land, a 20-storey Grade A office building with retail podium located in Daun Penh will add 18,500 sq m (199,132 sq ft) of NLA to the current office stock. Construction for the first phase began at the end of 2013 and is expected to be ready for occupation by 2017. The property has been available for pre-leasing since launching in Feb 2015. 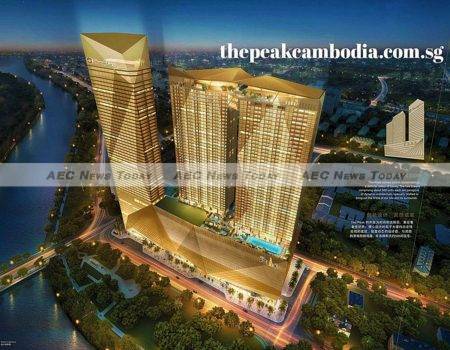 Maybank Group’s headquarters on Norodom Boulevard is set to be completed this year adding a total of 4,602 sq m (49,536 sq ft) NLA to the existing stock. Maybank building will be partly occupied by the bank. Lion Group’s proposed mixed-use development located across from the Phnom Penh international airport has started construction and is slated for completion by 2017. The development will include a 7-storey mall that will add 45,500 sq m (489,758 sq ft) of NLA to the retail stock. The Peak is a new mixed-use development being undertaken by Oxley Worldbridge, a joint venture between Singapore’s Oxley Group and Cambodia Worldbridge. The project will include a hotel component operated as a five-star Shangri-La hotel, part of the Kuoc Group of companies, whilst another Singaporean developer, TEHO International, will construct a similar mixed-use development with the hotel component being operated as a five star Okura Prestige hotel. Phnom Penh Tower constructed by Hyundai Amco, continues to be one of the more popular office buildings with Japanese companies, including Sumitomo Mitsui Banking Corporation, The Bank of Tokyo-Mitsubishi, JETRO, Fuji Electric, Tama Global Investments and Creed Group. Hyundai Amco is also the main contractor for the construction of ACLEDA’s headquarters along Monivong Boulevard. Aeon has maintained high occupancy at 95 per cent, which is a positive sign for the retail market. Domino’s Pizza and Lotteria & Pepper Lunch are among some of the larger international F&B newcomers that can be found in Aeon Mall, while fashion retailers such as Giordano, Penshoppe and Levis have also opened their first outlets on the mall’s ground level. Some high end retail outlets were initially part of the tenant mix but were forced to vacate recently due to poor sales and high rental prices. Retailers such as L’Occitane, Clarins, TWG, Hugo Boss & Eric Kaiser occupy Vattanac’s retail podium, which is more than 50 per cent occupied. 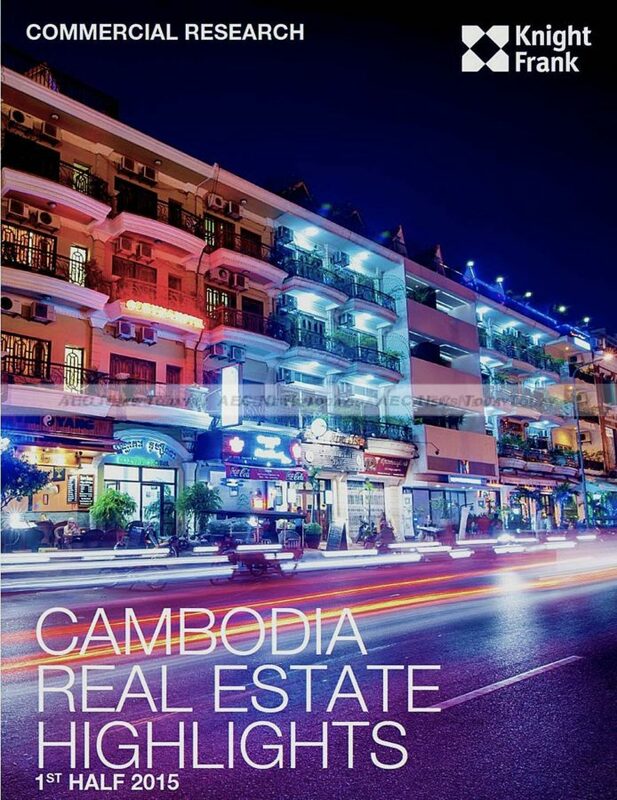 More detailed information on the Cambodia property market can be found in the Cambodia Real Estate Highlights 1H 2015 Report released earlier this month. The 10-page report provides key information on developments in the retail and office sectors in Phnom Penh, pertinent to investors, developers and end-users in their decision-making process. 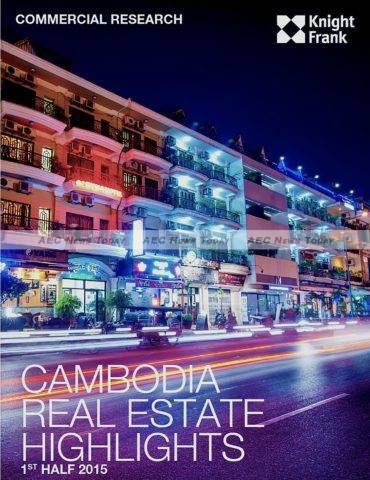 Readers of AEC News Today can download a free copy of the Cambodia Real Estate Highlights 1H 2015 Report from Knight Frank Research. With over 110 years’ experience and a global network of more than 370 offices and 12,000 staff, Knight Frank LLP is the leading independent global property consultancy. 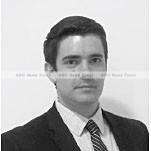 The Group advises clients ranging from individual owners and buyers to major developers, investors and corporate tenants.